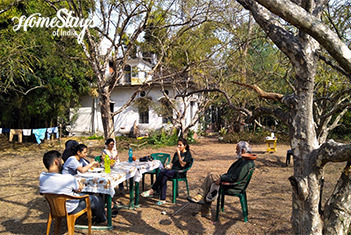 Pawalgarh has often been mentioned in the memoirs of Jim Corbett and has been the territory of the mythical and majestic tiger named “Bachelor of Pawalgarh”. 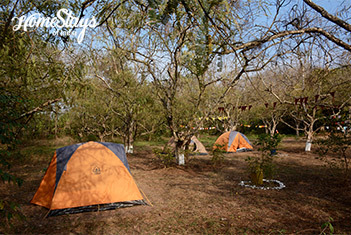 Situated in the vicinity of Corbett National Park, Pawalgarh is located 20 km north east of Ramnagar. This Kumaoni village at the foothills of Himalayas is known as an organic village for its richness in medicinal plants, species and herbs, many of which grow naturally around agricultural fields and also cultivated by the farmers. Locals here are mainly involved in farming, forestry, horticulture, and handicraft. Being a quaint and biodiversity region it’s a heaven for environmentalists, naturalists, philosophers, researchers, students, artists and families nonetheless. 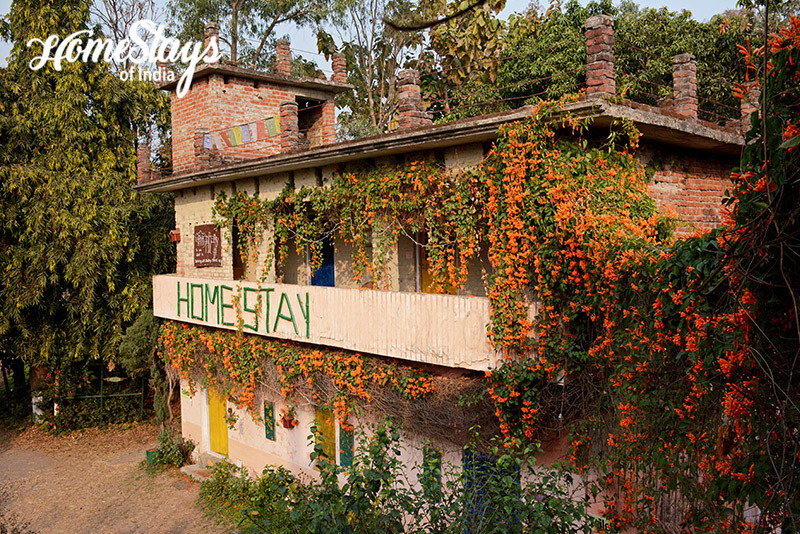 Engulfed in the tropical deciduous forest, this village home served as one of the initial bases for Uttarakhand State Movement as well as the Forest Conservation Movement in the early 80’s. Since then it has been a torchbearer of eco-tourism in Kumaon region of Uttarakhand. 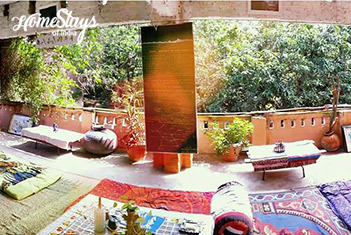 The eco-homestay hosts a lane dedicated to the martyrs of the state movement ” Shaheed Park”, orchards, camping site, a rooftop café and approx. 65 species of birds which you can sight even while sipping a cup of tea or a during a stroll in the morning. Majority of the waste is recycled and the focus is on eco living. 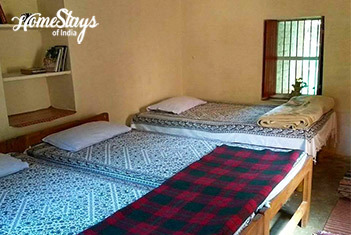 It consist of 2 double room, 1 triple room and a 9 bedded dormitory with 6 common toilets and 4 bathrooms. 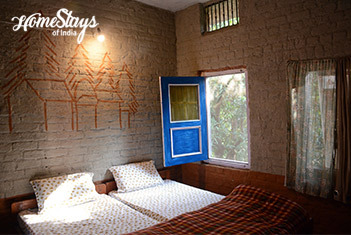 The idea here is for the visitors to cut off from the city and soak in nature, in all its beauty and imperfections. Mr Manohar and his family is the descendants of the Katyuri dynasty. He is an activist, a philosopher and a rebel at heart. Majority of the flora in the campus is a result of his efforts and his love for nature. His wife, better known as Basanti aunty is an epitome of simplicity who just spreads magic with her smile & affection. The team who run the campus includes Vikki, a naturalist and a trained guide who knows his forest very well. 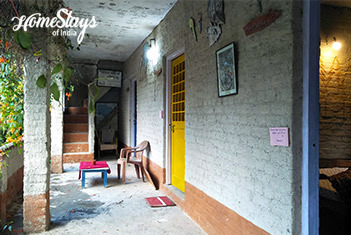 Roopsi handles day to day activities of the homestay and runs the café. Naveen makes sure that you are well fed while enjoying your experience here. The food served here is pure organic, home-cooked, healthy and wholesome. They satisfy your taste buds with dishes ranging from authentic Kumaoni food to continental delicacies. Hot served Aloo Paranthas, chutney and chai in breakfast and Cheese Sandwiches with coffee in the evenings will keep you energized. Non-veg food is served on request.